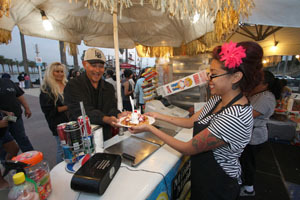 SAN PEDRO, Calif. — August 9, 2011 — Building on the success of the free Summer Concerts On The Waterfront series, the Port of Los Angeles has expanded the four remaining performances to include magic, juggling, puppetry and other youth-focused entertainment. Additional entertainment will begin at 6 p.m. prior to the four remaining concerts, which all start at 7 p.m. Free parking is available at Harbor Boulevard and Swinford Street as well as at the Catalina Express parking lot. August 11 – L-360 Band (two-man variety). Preceded at 6 p.m. by Fantastic Patrick juggling and unicycle performance. August 18 – Smokin’ Cobras (50s through 80s hits) Preceded at 6 p.m. by Franklin Haynes Marionettes. August 25 – One Ten South (blues, funk, rock) Preceded at 6 p.m. by The Amazing Paul Wei magic performance. Sept. 8 – Jamnesia (dance) Preceded at 6 p.m. by Celebration Sensation stilt walkers.